Highland Coffees, open since 1989, is a specialty coffee and tea shop located just off the corner of Highland Road and Chimes Street at the historic North Gates of Louisiana State University in Baton Rouge. We are committed to the highest quality in all that we provide. We start by bringing in outstanding green coffee from the world’s great producing countries and roasting it in our shop. Once roasted, the coffee, marked with the roast date, goes immediately to our retail shelves to be made available for customers to take home, is packaged up to be sent to our online customers, or is used in our shop as the starting point for all of our coffee drinks. We also bring in an extensive line of fine teas from the traditional tea growing regions of the world. Our tea selection includes excellent green teas, black teas, oolongs, white teas, flavored teas, and herbal teas. All of our teas are available to take home or to enjoy in our shop. Most are available for online purchase as well. To accompany our coffees and teas, we offer a large selection of delicious pastries, including cheesecakes, cobblers, fruit tarts and other items in our refrigerated case, along with breads, muffins, bagels, biscotti, and more. For the chocolate lover, there is plenty to find among our pastries and within our line of chocolate confections. 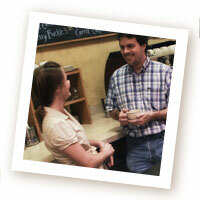 Highland Coffees has abundant seating inside in a relaxing atmosphere and outside in our spacious courtyard. Come in and enjoy a drink from our complete line of coffee and tea options, which includes brewed coffees, hot and iced teas, lattes, mochas, granitas, our popular selection of frozen blended drinks, and chai. Of course, wireless internet access is free. We look forward to seeing you in the shop or hearing from you any time.